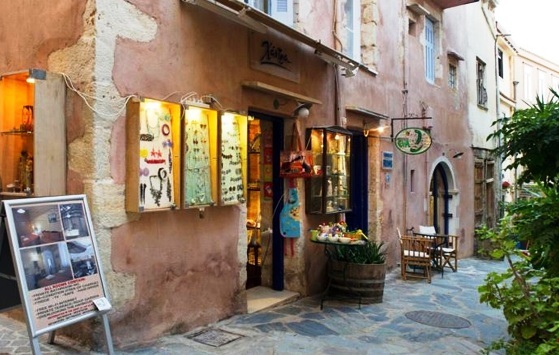 Cheap Hotels in Crete - choose your budget accommodation and travel options, and leave more money in your kitty to enjoy the real Crete with her beaches, villages, music and history. How to find a cheap flight to Crete, ferries to Crete, budget accommodation in Chania, Rethymnon, Heraklion and Lasithi, and how to get around on the well-run and convenient local buses. Here on this page and throughout our website you will see the blue and white backpack (left), which is the budget symbol. Cheap flights to Crete - find flights into the airports in Crete from all over Europe. Or connect via Athens, with a connecting flight with duration of 1 hour to Chania or Heraklion. Ferries to Crete - take an overnight ferry from Pireaus, the port of Athens, with a duration of about 9 hours to Chania or Heraklion from Athens. 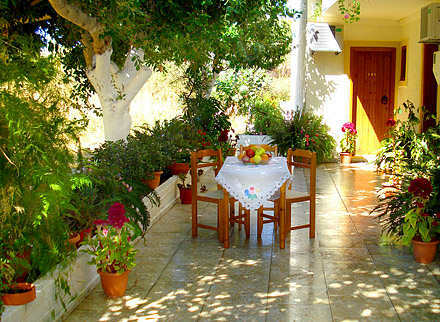 Cheap Hotels in Crete - in each of the capital towns we suggest a good budget option, but do not compromise on location. 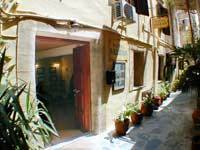 In Chania Old Town, a good budget small hotel is Hotel Helena. This location is still within the walls of the old town, surrounded by atmosphere, and close to the old harbour. Another small pension in the old quarter is Pension Eva, within a restored 17th century building, this place has loads of character with a small pricetag. 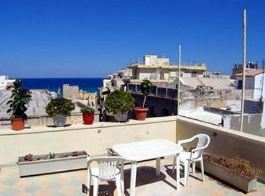 Completely charming with wonderful views from the rooftop terrace. 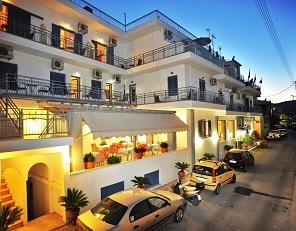 Afrodite Aparthotel is central and convenient, with self-catering options. Located within the walls of the old town of Rethymnon in a quiet area, yet still close to tavernas and cafes. Clean and well-equipped rooms make a perfect base to explore the town and the region, not to mention a great host who will show you real Cretan hospitality. 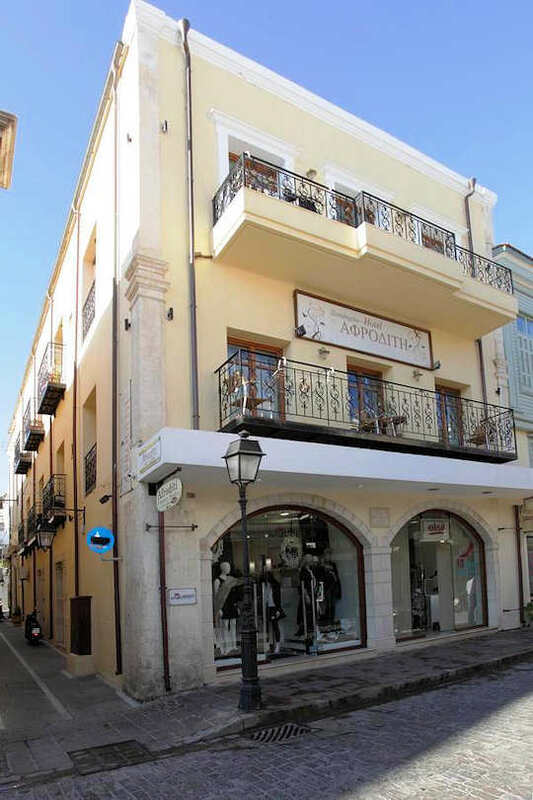 Mirabello Hotel is central and close to the bus station, bus stops and the Liondaria Square, the markets on 1866 Street and the pedestrianised streets of downtown Heraklion, with shopping and cafes. Pergola Hotel is affordable and in an excellent location to access the ferry port, harbour and lakeside. Ask for a seaside view, many of the rooms have balconies. The rooms have basic kitchenette. Wonderful service in this family-run local place. Agios Nikoloas in eastern Crete. 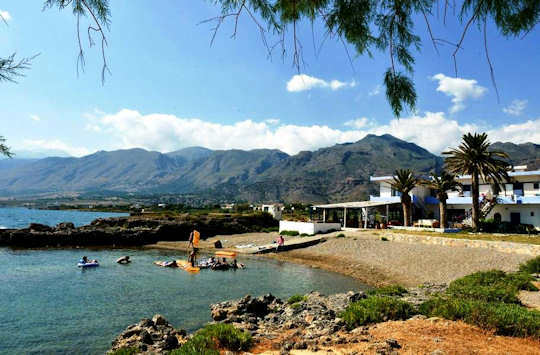 Cheap Hotels in Crete - stay near the beach, by which we mean, very close to the beach, that is by our criterion, less than 1 km walk from the beach, in budget accommodation that will leave you with some extra cash for food, transport, coffees and exploring. Cheap hotels in Crete - in the west of Crete, just back from Maleme Beach is Electra Pension which is a good budget option really close to the beach and tavernas, cafes and bars of this long, sandy, yet busy beach. Located 16 km west of Chania town, this pension is accessible by local blue buses from Chania bus station. Be aware that this hotel is 200 metres from the beach and that there is a road next to the pension. The price, hospitality and location balance these factors and create a good, budget hotel option near to the sea. 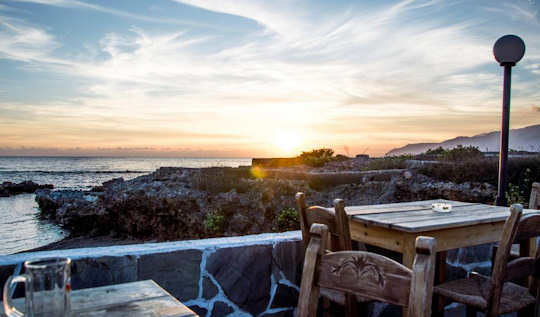 Cheap Hotels in Crete - 55 km south of Rethymnon sits the seaside village of Frangokastello named after the 'Franks Castle' that was built here by the Venetians centuries ago. 'Franks' was the term for the invading Venetian settlers. The castle had a turbulent history, and now sits in ruins next to the sandy beach. Coral Guesthouse is a small family-run hotel with good, budget rates, located directly on its own beach. Snacks and drinks are served on the property. A handy store can be found less than 50 metres from the hotel. Visit the ruins of the castle, said to be haunted, explore the mountains inland and the mountainous region of Sfakia. Stretch out your warm summer days in Crete. 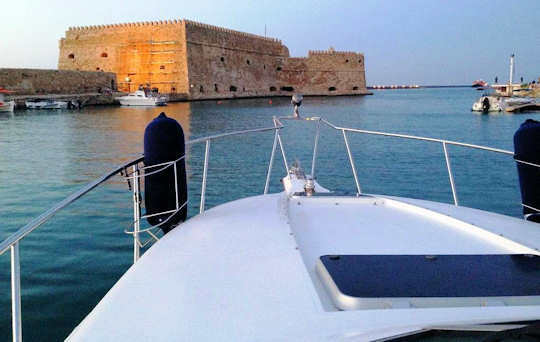 Cheap Hotels in Crete - try something different, slumber to the gentle sound of calm water inside this tidy boat Pegasus in the historic Old Harbour of Heraklion. This is an experience in itself, why not give it a try and meet the boat's owner who is a local and will help with anything you might want to see in town. The boat is moored very centrally for exploring the town, at half the price of the accommodation located around the port. View the Venetian Koules Fortress from your own deck, sip wine and relax to watch the sunset in your own privacy, prepare food in the small kitchen, or dine at the local seafood tavernas. Rest comfortably in the double bed (a sofa bed is also available). Be aware that conditions are very tight and squeezy in a boat, also note that there are steps to get in and out of the vessel. Slip out of bed in the morning and step right into the fresh air of the marina, and the Marina Cafe on your doorstep (good coffee). 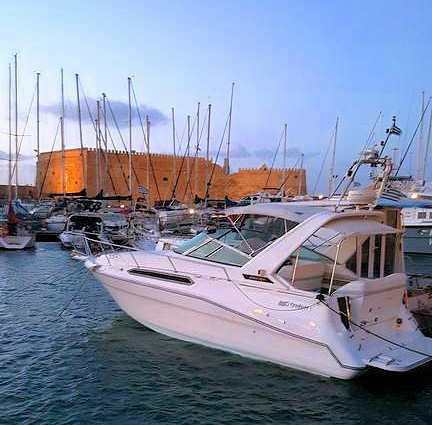 All the sights, museums, shopping and history of Heraklion are an easy five minutes walk. Save money on transport by using the reliable, punctual and comfortable local buses. Taking the KTEL buses on Crete means you to keep costs down and therefore you can travel all over the island, stretching your hard earned travel money further and further and adventuring to all corners of this incredible island.